The big features this year might be 3D and smart TV, but that doesn’t mean everyone wants them. 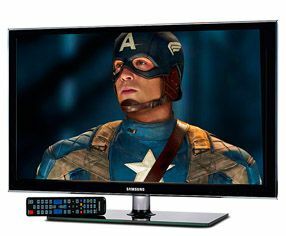 If you’re one of those people who doesn’t particularly feel the need, you may be interested in this Samsung, a 32in TV that boasts premium picture-enhancing features such as LED backlighting, motion processing and, of course, a Full HD resolution, but hits a very affordable price by leaving out those headline features that some might consider unnecessary. It’s an attractive set, too. The bezel’s a bit thicker than the excellent Samsung UE32C6530, but this much cheaper model is as ‘ultra’ thin at just 3cm deep. In fact, both models share the same rear panel, so the D5000 matches its premium stablemate’s collection of connections, which includes four HDMIs, two USBs and a component/composite connection (via adapter) on the right-hand side, and a LAN socket (for firmware updates) facing down. Our only concern in this area is how awkward it is to get to the headphone out, especially if you’ve wall-mounted the TV. The D5000’s performance can’t quite match the very best premium sets, but for less than £500 (and we’ve even seen it dip below £400) it’s extremely capable. Play the Black Swan Blu-ray and the detail levels are excellent, enhancing the gruesomeness of the more horror-influenced scenes. Dark scenes prove the Samsung is capable of very deep blacks, but it can also contrast that with pure, punchy whites. On top of that it’s got a balanced and neutral colour palette. Only a little jitter and smear to motion provides a small fly in the ointment. The Freeview tuner lacks HD channels, but the D5000 upscales standard-def broadcasts and DVDs in fine style, producing a picture that’s very sharp and clean, and is kept well under control in terms of both colours and overall stability. Add an audio performance that’s decent for a TV this size and you’ve got a package that will appeal to the 2D-only crowd.